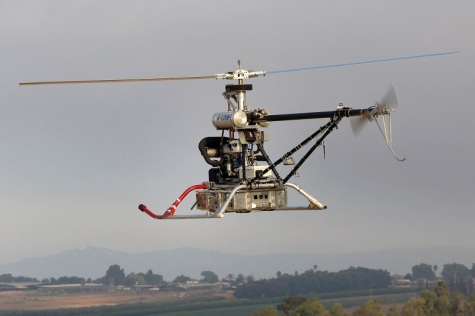 Israel Aerospace Industries' (IAI) Unmanned systems have successfully completed a proof of concept to high officials of the defense industry and the IDF. Recently developed by Israel Aerospace Industries (IAI), the Air Hopper took a part in a demonstration that covered two scenarios, one simulating carrying a seriously-wounded soldier to a extraction point for life-saving treatment, airborne monitoring of vital signs and real-time dispatch to the ground. The second scenario simulated carrying logistic supplies to an isolated force at the front line, which could not be accessed otherwise without risking more troops. The autonomous tactical system for logistic convoys responds to the need in transporting logistic equipment to the battlefield during warfare while preventing loss of lives and minimizing the risks faced by logistic convoys en route such as damage caused by roadside explosives, ambushes or anti-tank weapons. The operator using the autonomous system supervises the execution of the mission and the convoy's vehicles in real time from a safe area outside the threat range of the battlefield. The System's open architecture renders it compatible with a range of platforms with no need for special adaptations, maintaining the performance level of the vehicle concurrently with the weight capacity of the platform. The system moves independently and precisely over prolonged periods of time, day or night, including in tough field conditions and in any weather without compromising the quality of performances required to successfully complete its mission. In addition to the steering unit in the vehicles, the system is delivered with a sophisticated control system that allows it to manage many other operational capabilities such as vehicle control, real time planning and updating of routes, updating the convoy's behavior attributes, real time receipt of mission data and a data communication system that allows it to communicate with the vehicles. Shaul Shahar, Corporate V.P. & General Manager, IAI Military Aircraft Group said, "Both systems proof of concept step is an important milestone for IAI in the world of unmanned vehicles, developing the future battlefield and in offering optimal unmanned operational solutions that minimize the risk to human lives as much as possible. I believe these developments will open many doors for us in local and global markets, military and civilian alike."